There has always been a void in the story of how Ralph Hancock went from a Cardiff-based Marine Insurance Broker to becoming a Gifted Landscape Garden Designer, virtually over-night! It was believed that Ralph went directly from one career to the next. But, thanks to Trish Jennings, a retired school teacher from Somerset. And, through the memoirs of her late father, Frederick 'Fred' Charles Jennings, a retired Gloucestershire Constabulary Police Sergeant, we now have some answers to the question of how it all began. Born in London and raised in Ashcott, Somerset, Fred Jennings recalled, with remarkable detail, his first encounter with a man he referred to as a most memorable character. It was in the early 1920's that local landowners, Colonel and Mrs Warry, residents of Shapwick House, Shapwick, moved to a purpose built bungalow on the edge of nearby Loxley Wood. Their country house was leased by a family by the name of Griffiths. Fred recalled that the family had came from South Wales and were involved in the shipping business, as was another local family, the Howe's, who lived in Ashcott. Ralph Hancock was employed by the Griffiths family as their gardener. He, Muriel and his boys, Bramley and Denys lived in a cottage adjoining Shapwick House, known as The Island. Fred recalls that Ralph was recognised from the start as of very good education and he too was involved, somehow, in the shipping business in Cardiff. But, from all accounts, not successfully! Was Ralph an associate of the Griffiths or the Howes? Certainly both Frederick R Howe and T H Griffiths had connections to the shipping industry. Both were also Ship Brokers and both were based in Cardiff. TH Griffiths & Co were based at 12 James Street, Cardiff and are listed in the Owens & Co Directory of 1895 at that address and also at 11/12 at Mount-Stuart Square. F R Howe & Co are listed as being at Boston Building, James Street, Cardiff. We do know that Ralph was employed as a Marine and General Insurance Broker working out of 37 James Street, Cardiff, in 1923 (a business directory of the time lists Ralph at that address). The directory also lists a Martin & Hancock Commission Agents, also at 37 James Street Cardiff. It is quite possible that, at this time, Ralph was either employed by T H Griffiths & Co in Cardiff or had undertaken work for them whilst at Martin and Hancock Either way, we do know that Ralph Hancock and his family followed the Griffiths's to Shapwick. Interestingly, there may also be a connection with Ralph's Military career. In the London Gazette for 20 July 1917, a Lieutenant T H Griffiths M.C. is listed as being made a temporary Captain in the Royal Regiment of Artillery (Royal Field Artillery). A news report in the El Paso Herald-Post of 1934 reveals that Ralph himself admited to being interested in gardening since aged 8 and that he took-over the family orchid greenhouse when he was 13. Records from a bankruptcy hearing at Croydon in the 1940's also show that Ralph had held several positions as a gardener since a previous bankruptcy in 1921. Soon after arriving in Shapwick, Ralph became involved in catching rabbits. Fred recounts that he wasn't sure whether he (Ralph) had given up the gardening job or that he was now just part-time? Ralph sold the rabbits through Fred's father, a retired Metropolitan Police Constable, who was now the tenant-farmer of Bowerings Farm, owned by the influential Strangways family. After leaving London and the Police in 1908, Fred's father became the landlord of The Albion public house in Ashcott. He left the pub for farming in 1915. The ferrets and other equipment for catching rabbits were stored at Fred's fathers farm. Fred often accompanied Ralph and assisted in the catching process. He recalled; at the end of the day, the catch would be strung onto a pole and carried on the shoulders of Ralph and himself. Unfortunately, being a few inches shorter than Ralph, meant that the rabbits often slid to his end of the pole. When he complained, Ralph would tell Fred to "grit his teeth and to stand bolt upright!" Fred also recalled that he had never seen anyone so adept at handling ferrets. Hancock put his fearlessness down to always acting quickly when making a grab for their neck, thus eliminating the inevitable bite which would follow. However, he came unstuck one day. The ferret sunk its teeth into the tip of one of Ralph's fingers and wouldn't let go! Luckily, the local Headmaster, who had accompanied the hunters on their quest, managed to prise open the beasts jaws with a small pair of scissors. This incident did not deter Ralph one bit! Hancock also owned an old double-barrel, 12 bore shotgun which, quite frankly, had seen much better times. It was on a shooting trip, in the orchard attached to Bowerings farm, that Hancock had a mishap with the old firearm. Whilst shooting Rooks, he somehow managed to get one of his nostrils caught between the exposed hammer and the firing pin. The resulting action caused a severe gash to his nose which covered Ralph in blood. On a later rabbit hunt, Ralph was caught carrying the shotgun without a licence. He received a summons to appear at Bridgwater Magistrates Court. To get there he borrowed a bicycle from the Reverend Seamer. At the end of the hearing, where he received a fine, Hancock retired to the White Hart Hotel in Eastover. After one drink too many, Ralph took off home, on the wrong bicycle. Shouts of "stop thief" resulted in Hancock being pulled off the bicycle where he sustained a sprained ankle. He was taken to Bridgwater Hospital for treatment. He later satisfactorily explained his mistake and the Rev got his bicycle back. Fred recalled that Mr H was limping for quite some time. Fred also recalled a conversation which he had had with Ralph whilst at Shapwick. Hancock admitted to him that he knew very little about gardening. But, there must have been something, a spark even? Fred continued that Ralph designed a garden frame for propagating seedlings. The frame contained three compartments (tanks) of water. A heater, beneath the frame, provided warm water for the first tank which progressive got cooler until it reached the last tank. Once the seedlings had got used to the cold they were moved into open soil. Fred wrote that Ralph and his young family left Shapwick sometime in late 1924. Before he departed Ralph had helped Fred's father to gather in the cider apple crop. Mr H was paid 6d per sack and usually managed to pick 15 sacks of apples a day for which he received 7/6d or 37.5p in new money! He recalled that Hancock could hold-his-own with the villagers at the task. And, that Muriel made the best shortbread that he had ever tasted! In the summer of 1925, Ralph Hancock was to reappear in the village. Driving a Citroen Cloverleaf three-seater. He was accompanied by Eric Pittard*, whom he introduced as his business partner. Claiming to be on a business/holiday trip, Hancock sought permission from Fred's father to camp in one of his fields. During the next two weeks Hancock revealed that he had, with Pittard, set up a business, The Country Service Association Ltd. Based on similar lines to the much more successful Country Gentleman's Association. Hancock offered membership, for a fee, for which members were given the opportunity to buy goods, by mail order, at a much reduced rate. Fred recalled that, at the time, he thought that the business was really a poor man's version of the superior Country Gentleman's Association. Ralphs business card for the short-lived Country Service Association Ltd.
On a visit to Hancock's tent one evening, Fred found it empty apart from a large amount of catalogues and leaflets, for everything from wheelbarrows to traction engines. Before Hancock left, he had mentioned that he would shortly be looking for an office boy at his offices at No. 22 Maddox Street, London W1. Fred's parents had no objections and so it was agreed that Fred would travel to Stoke Newington, London, where he would stay with relatives. Fred recalls that the offices of The Country Service Association were either on the second or third floor of Maddox Street and consisted of three rooms. Hancock was in one. Muriel, working as his secretary, in another and in the biggest office was Pittard, two typists and a chap who's name Fred couldn't remember, and a desk where Fred would work. His wages were £1 a week rising to £1 and 5 shillings. He was immediately set to work stuffing a printed circular into addressed envelopes. He later learned that the recipients were obtained from the lists of Friends and Patrons of various hospitals, including the one which Hancock had previously been taken to at Bridgwater. After a time it became apparent, judging by the amount of letters received, that the response to the circular was practically nil. In his memoirs Fred writes that he thought that it wouldn't be too long before he would lose his job and head back to Shapwick. In all, the job lasted just 12 weeks. Newspapers in both Kent and Sussex carried a series of advertisements for the Association looking for local representatives. It is not clear whether these notices received much attention either? Fred also recounts what he thought was the final nail-in-the-coffin for the business**. One Saturday in October 1925, Ralph and Eric attended a Rugby match at Twickenham. After the game, and several drinks, Hancock was arrested for being drunk in charge of the Citroen. In early November 1925, Ralph appeared at Bow Street Police Court. He was found guilty of the offence and fined £5 with £7.7s costs. His licence was revoked for 6 months and he was sentenced to one month in prison. Incredibly steep for a first offence. Fred recalls that he heard no more of Hancock until, a fews years later, he read in one of the daily newspapers that an Englishman (sic) named Ralph Hancock FRHS, had been given an award for a roof top garden which he had designed in New York. And a little later, when Ralph's book; When I Make a Garden, was published. In his memoirs Fred says; That was the last that I heard of Hancock but he was an example of the fact that an enterprising man couldn't be kept down! 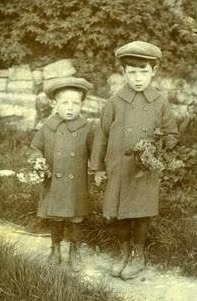 (Image left) Frederick 'Fred' Jennings (Right) and his brother Cliff. This picture is dated June 1914. (Image right) PC 49 Frederick Jennings, Gloucestershire Constabulary, 1931/32. * The London Gazette of May 1919, lists a Simon Eric Pittard as Liquidator for the Stathe Steamship Company and for the Reid Steamship Company, with an address for Pittard as Crichton Buildings, Mount-Stuart Square, Cardiff. The offices were only yards from Hancock's own office in James Street. Coincidence? ** The London Gazette of 7 January 1930, contained a notice, under the Companies Act 1929, informing creditors of the company that a meeting was to be held 3 days later. It was signed by an FJ Fish, Acting Secretary. Later, in the same publication dated 15 June 1937, the The Country Service Association was officially 'wound-up'. Copies of the Memoirs of Fred Jennings, edited by Trish Jennings and produced by Noodle Books, can be purchased directly from Amazon .